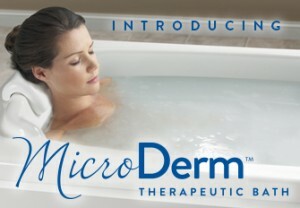 The MicroDermTM Therapeutic Bath provides a stimulating bath that makes skin feel softer and more energized. Liquid film technology super-saturates the bath with up to 50 percent more dissolved oxygen molecules than in regular bath water to gently stimulate and soften skin. Each jet can be adjusted directionally and to increase and decrease the volume output for maximum comfort.